One of my favorites is miniature apple pies. The warm cinnamon coated apples with just the right amount of crust is delicious! It’s always a hit and can be easily whipped up for any event or bake sale. Enjoy! Place each round in the crevices of the miniature muffin pan creating shells and bake for 8-10 minutes, or until slightly brown (watch carefully). Transfer to cooling rack to fill. As the pie shells are baking place apples, cinnamon, nutmeg, sugar, and butter in sauce pan on stove on medium heat. Stir occasionally and heat until apples are moderately softened. 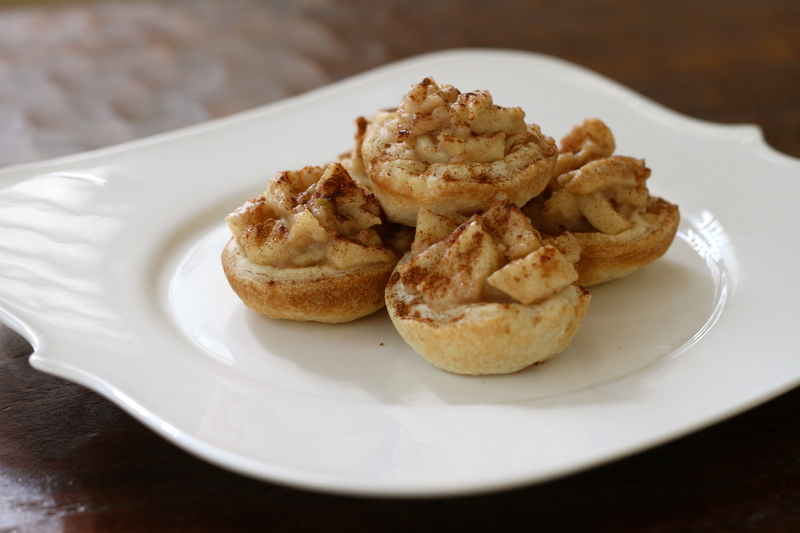 Sprinkle extra cinnamon on top of each miniature apple pie. Can be served immedaitely or at room temperature. Love this!!! I think I could actually make these. You’re the best Amy… Keep em coming!